Building a great looking and easy to use website is an essential marketing tool these days for food-based businesses such as Restaurants, Cafes, Bars and Pubs. In the age of social media, people will often search online for reviews and information about a business before visiting which is why its so important to have a great looking web presence – if you have an out of date or poorly designed website the potential customer could assume that your establishment will also be dated or poorly run. Luckily, with WordPress and one of our hand-picked WordPress Restaurant Themes there is no excuse for a bad website. 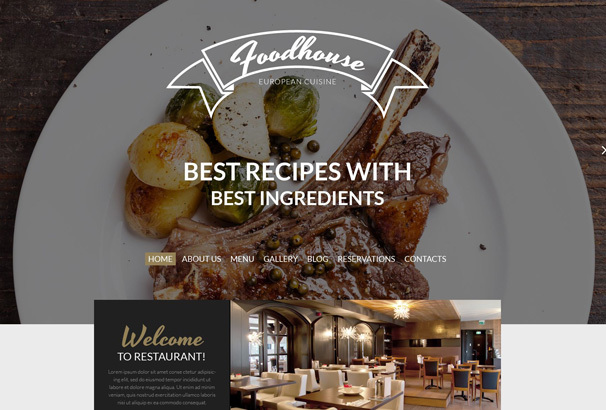 Using the power of WordPress and a Restaurant theme you can create a beautiful website for your business with special features like online menus, bookings, galleries, integration with Facebook, Instagram, Pinterest and Twitter to help drive social interactions and much more. This collection contains over 60 beautifully designed themes you can use and customize to fit your own style and branding and they wont break the bank, the themes listed here all cost around $50 or less. Wonderfully responsive, Divi displays equally well across all devices. This quality WordPress theme gives you all the building blocks to create your ultimate and fully bespoke website with absolute ease. 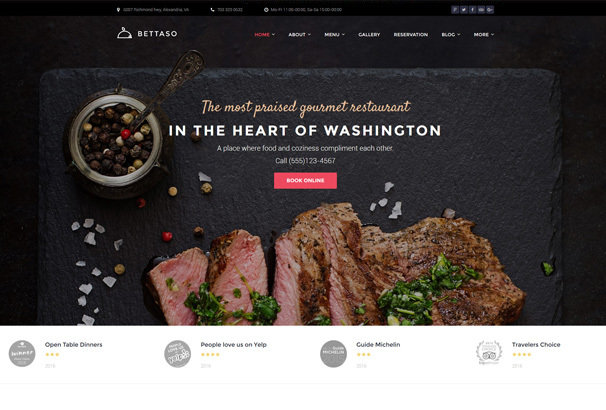 Developed for gourmet restaurants, Bettasso is a fully responsive, SEO optimized theme from WordPress. Its fully customizable range of options give you everything to create a stunning website which will really whet the appetite. 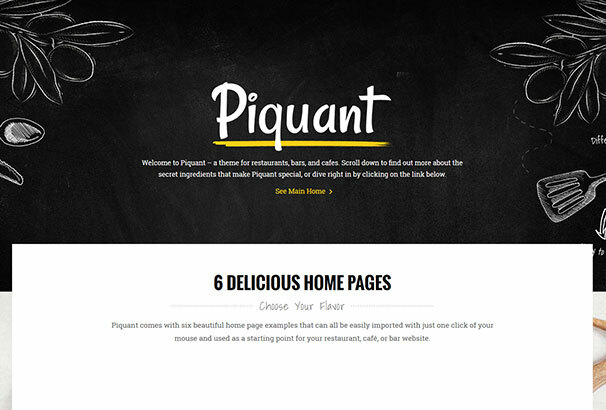 This theme will pair perfectly with a number of food related web projects. Simple, clean design and a fully flexible selection of quality options combine to make this a theme which will have mass appeal. This theme’s simple to use drag-and-drop feature makes it very appealing to non-tech savvies. Tiled imagery, stunning typography, and clean lines make this a highly appealing theme for many types of eatery. 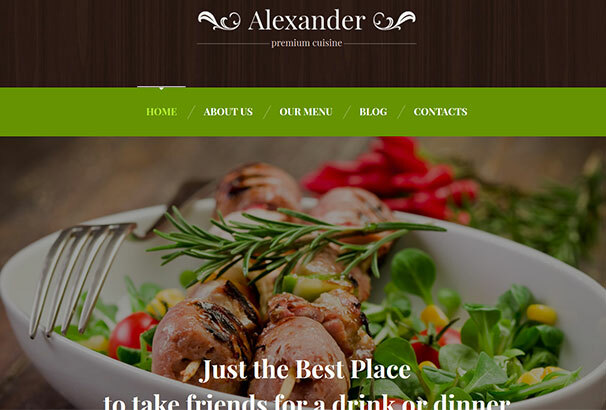 Alexander has much to offer the discerning restauranteur not least its stunningly streamlined design. A highly customizable and extensive range of features add further to the appeal of this quality theme by WordPress. 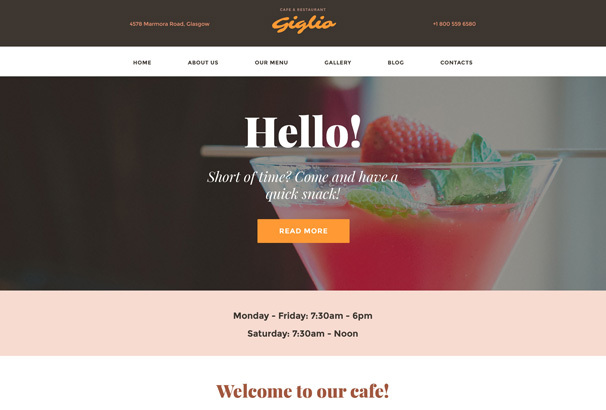 Keep your existing customers up to date with your eatery’s daily specials and menu options with this quality WordPress theme and also enable new visitors to find you easily with integrated Google Maps technology. 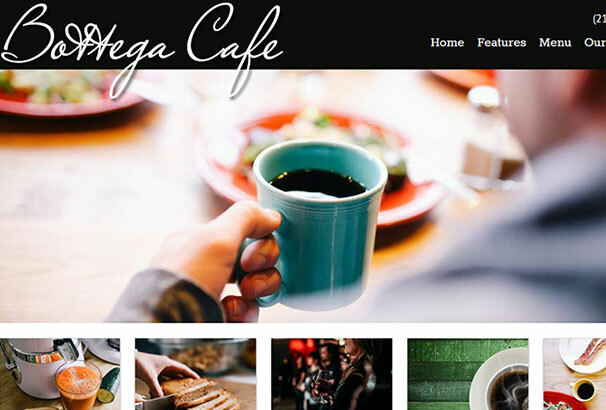 Boasting numerous features which can be tweaked to your liking, this theme from WordPress allows for the easy creation of a truly unique website for your restaurant or café. Images are given prominence here, allowing you to showcase your edible offerings to their very best advantage. Utilizing the power of HTML5 and CSS3, this theme brings you a truly delicious design paired with ultra lightweight code for fast loading times. Built in accordion and carousel sliders are sure to help tempt your visitors . 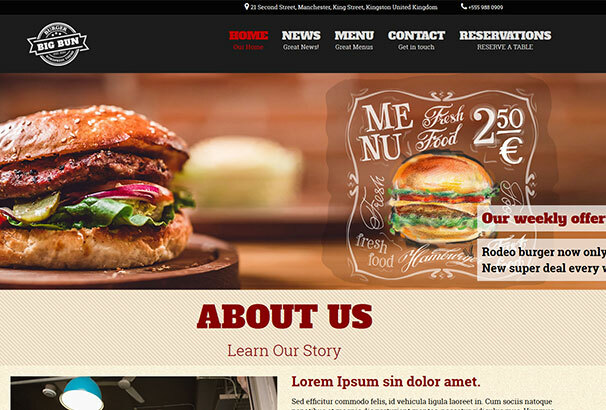 Burger is a lightweight, clean, super flexible and fully responsive theme for fast food restaurant owners. Built on Twitter Bootstrap Framework it will display equally well across every device. Greek Restaurant is a streamlined, modern and responsive theme with an inbuilt complete WordPress customizable panel. 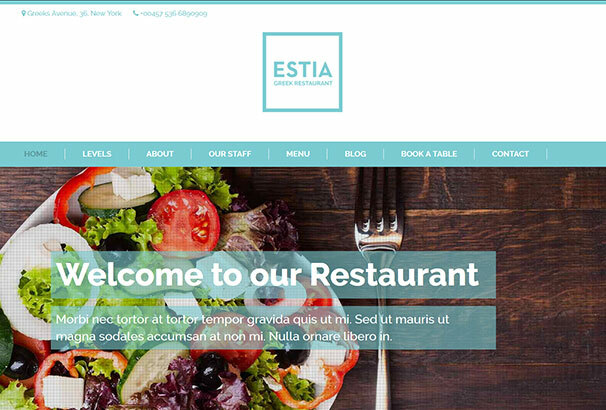 It is ideal for restaurant owners who want a clean and flexible theme and is suited not only to Greek restaurants! 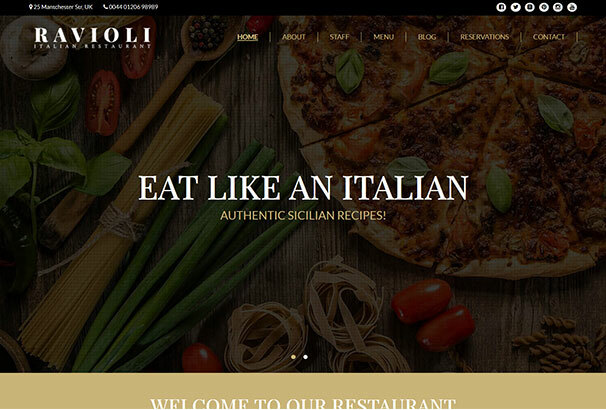 Ravioli Italian Restaurant is an elegant, stylish, responsive, multipurpose restaurant WordPress theme based on the infamous Twitter Bootstrap boilerplate. 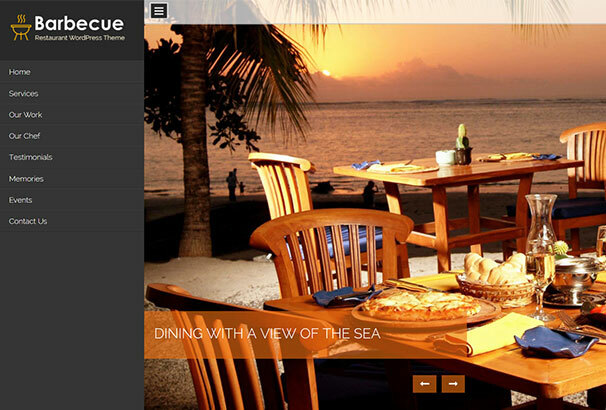 This one comes complete with a fully integrated restaurant reservation system, shortcodes and various layouts. 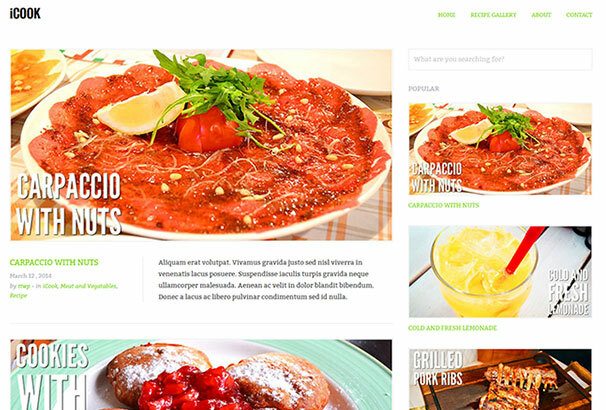 Restaurante is a lightweight bootstrap theme for restaurants, barbecues, grill houses, Italian restaurants, fast food, pizzerias and more. SEO optimized and fully responsive, this theme will display equally well on either iPhone and PC. 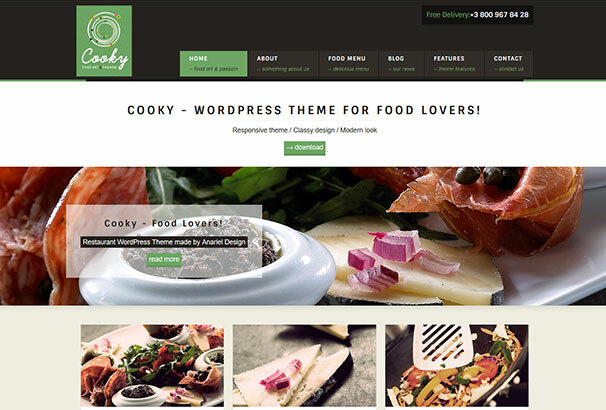 iCook is a superior theme by WordPress exclusively designed for hotel, restaurants, private chefs and coffee bars. You will really tantalize their taste-buds with the assistance of this great theme and its fantastic flexible features. 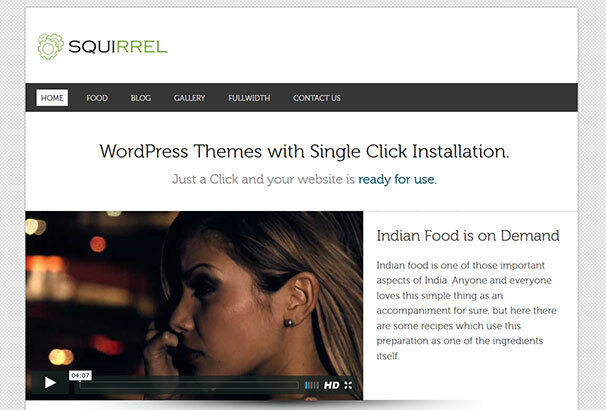 Squirrel is a stunning, simple, multipurpose WordPress theme which can be used for numerous food based websites. 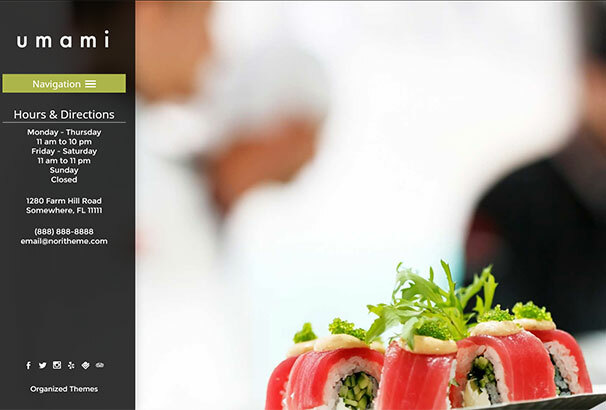 Super easy customization makes for the easy creation of a truly unique website for your restaurant or café. 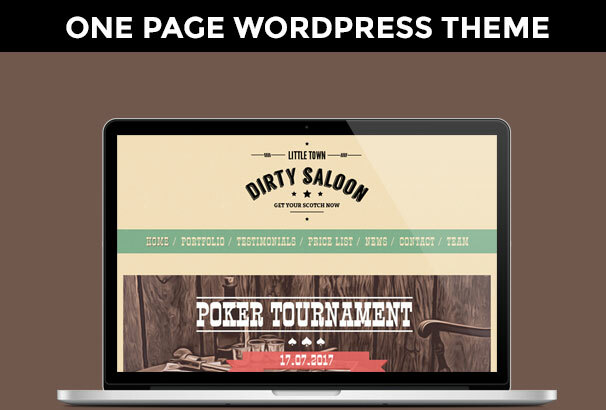 This Dirty Saloon WordPress theme will give your bar or eatery a distinct ‘Wild West’ flavor. SEO optimized and fully responsive, this theme displays equally well across all devise. 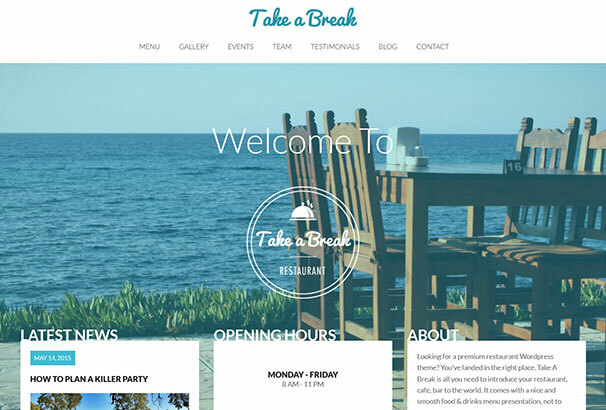 Take A Break is a responsive one page WordPress theme created for restaurants, cafes, coffee shops or any other food and beverage industry related websites. It is based on Twitter Bootstrap framework v3.3.0 and fully search engine optimized. 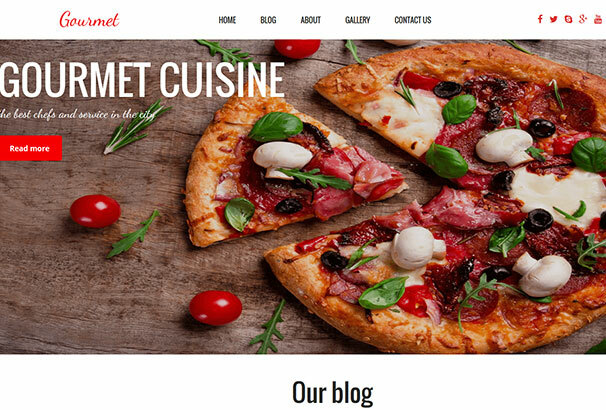 Gourmet is a really appetizing theme that is sure to appeal to many food businesses. Restaurants, coffee shops, pizzerias, bistros and bars can all benefit from the amazing range of highly customizable features it offers. 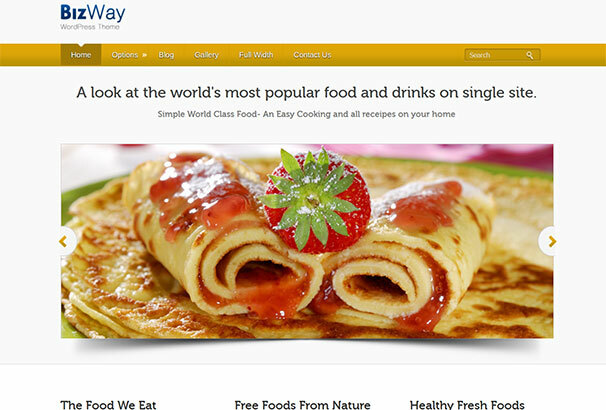 BizWay is a simply designed, fully responsive WordPress theme for the food industry. 100% SEO optimized and fully responsive for great readability, this quality theme could really help you to increase your online presence. 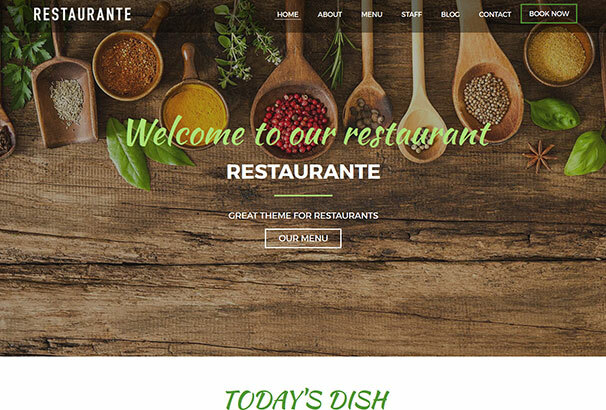 The classy and elegant design of this fully responsive theme by WordPress will appeal to high end restaurant establishments in particular. 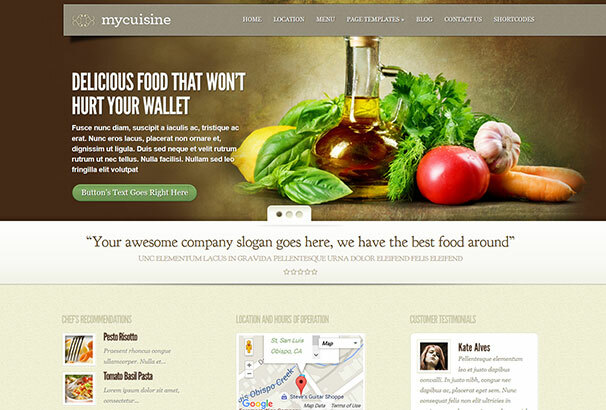 Showcase your stunning cuisine in style with the help of this superior theme. 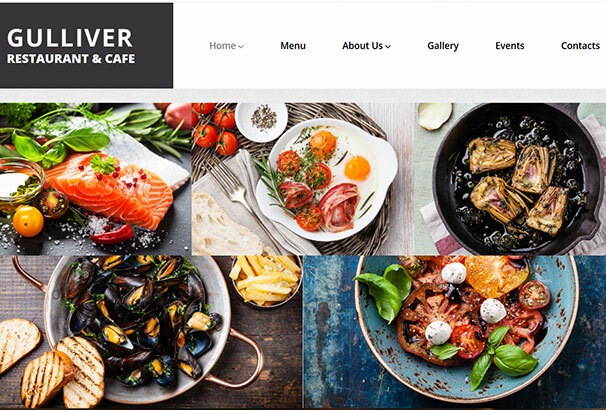 Present your delicious products in their very best light with this responsive WordPress theme designed for cafes and others. Funky and modern in design, this theme comes with many premium features as standard. 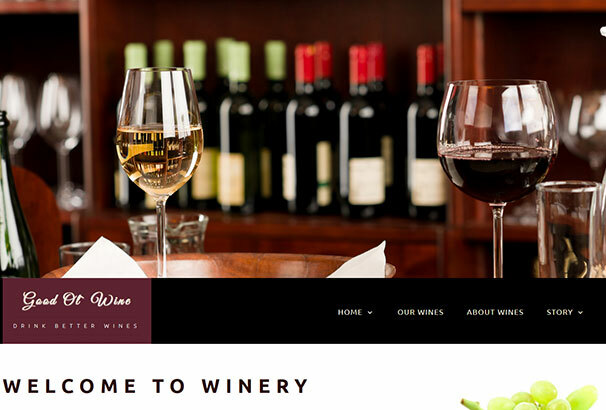 Wine enthusiasts and wineries will see the appeal of this beautifully crafted theme by WordPress. Elegant and sleek in design, it is 100% responsive for increased readability and SEO optimized to help your business perform at its very best. 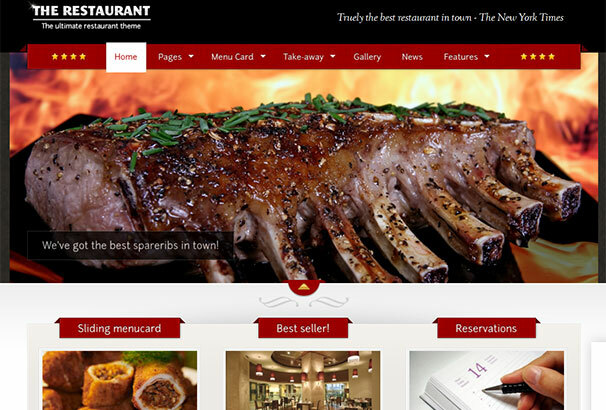 Barbecue WordPress theme is distinctly designed for barbecue restaurants but can also be adapted for use by others. A choice of 10 pre-built color options is just one of the super flexible features of this fantastic theme. 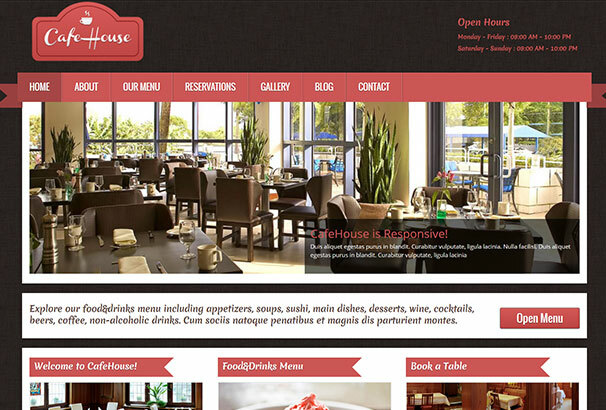 CafeHouse is a powerful WordPress theme designed just for coffee shops, café’s or coffee lovers. Sophisticated and clean in design, its full range of features are 100% customizable to give your coffee its very own distinct flavor. 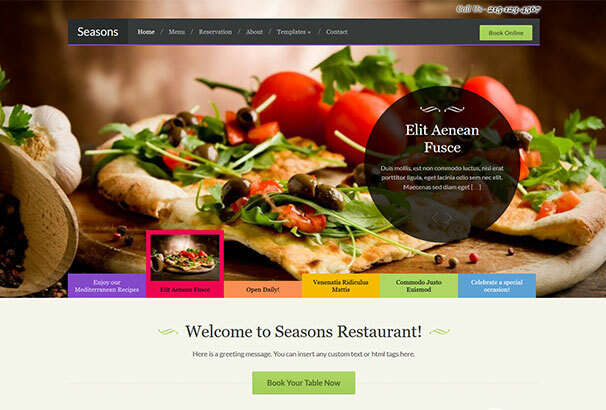 Seasons is an elegant WordPress theme perfectly suited for restaurant, bars, cafes and other food-related businesses. Appetites will increase with this theme’s stunning image display options enabling you to display your delicious dishes at their very best. 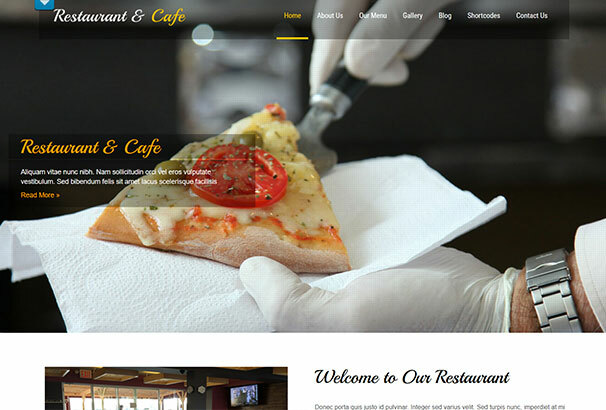 Create a professional website for your restaurant or cafe business simply and easily with this amazing theme. The homepage is completely customizable via custom dynamic widgets specifically built to help you promote your food business to the max. 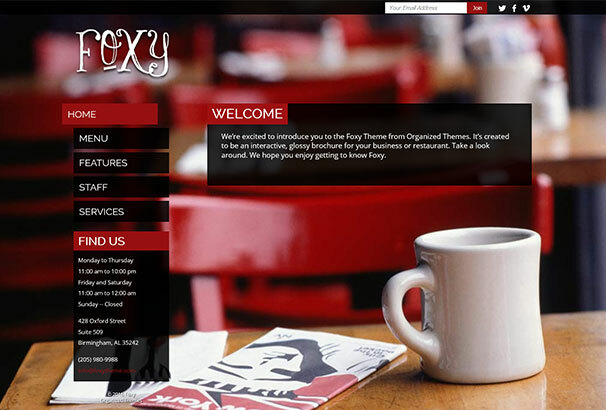 Foxy is an ultra contemporary WordPress theme that’s perfect for fashion sites, businesses, or restaurants who want to impact their visitors with big, bold images. Stunning typography and a full range of customizable colours add to its strong appeal. 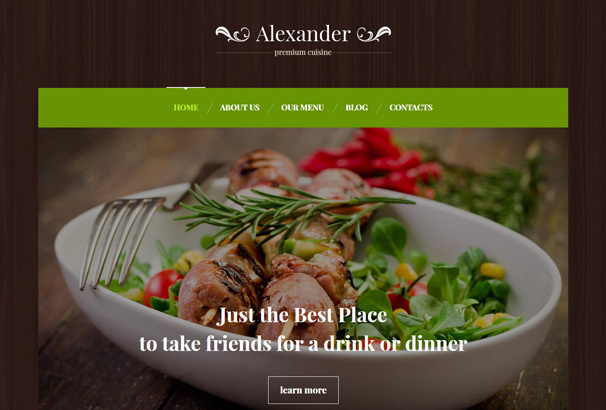 Restaurant features an elegant design and layout geared towards restaurants, cafe’s, food bloggers and other cuisine related websites. 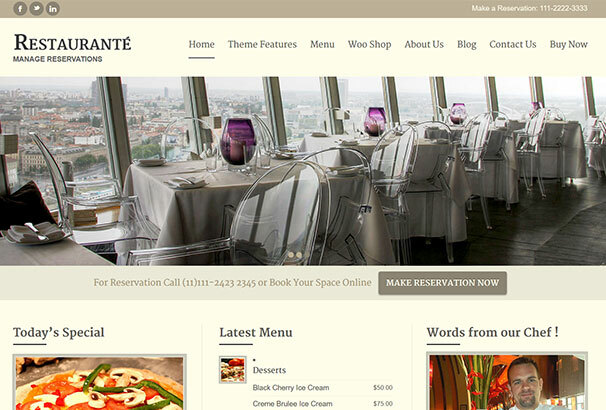 The Restaurant Theme features a custom post type and page template for displaying food and drink menu items. Event is a bold, fluid, and fully responsive theme by WordPress. Built for music, event, and entertainment sites, Event comes with three custom post types and a full range of other premium features. 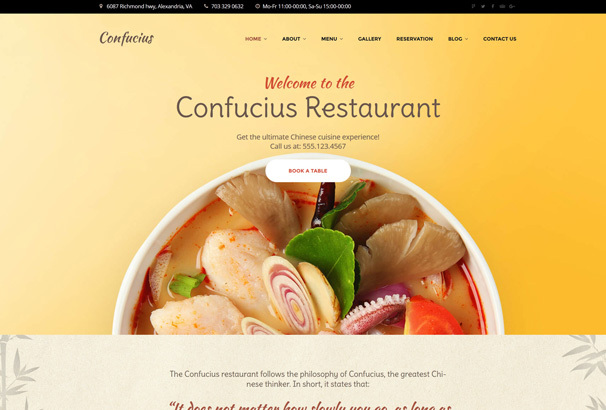 This beautiful theme by WordPress is suitable for use by many different types of eatery or food business. Its classic yet contemporary design and image centered display will showcase your finest food in style. 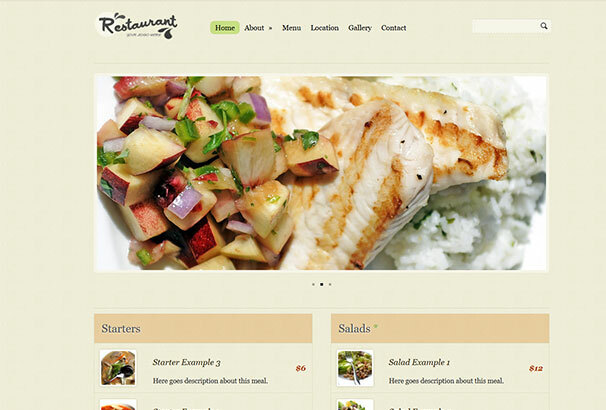 Rezo is a WordPress theme for cafe, bar, and restaurant based sites and blogs. Featuring a slick homepage slider to show off promotional content and the ultra popular lightbox gallery to showcase your images, this could be your perfect website creation partner. 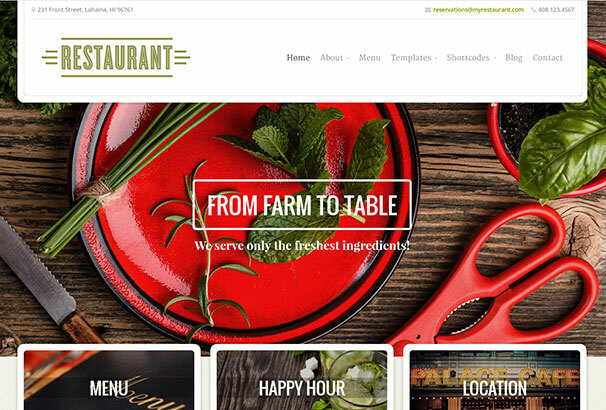 This stunning WordPress theme for restaurants and bars enables you to build your website’s homepage exactly the way you want it by using our custom content widgets, no coding skills required! Split is a fully responsive WordPress theme created with a split scrolling feature, allowing you for a cool splitting effect as you scroll from one row to the next. Paired with its modern and sleek design, this makes for a website sure to have widespread appeal. 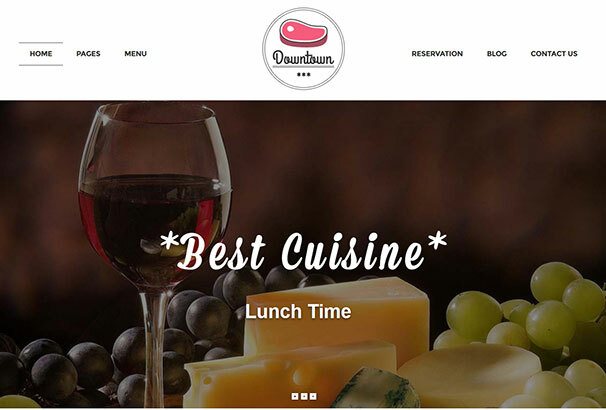 Downtown boasts modern, clean, responsive design and plenty of features specially designed with restaurant site owners in mind such as integrated reservation form, filterable menu, recipe pages, custom widgets, social media integration and Google maps. The quality Landing WordPress theme comes with Themify’s drag & drop Builder and all the tools you’ll ever need to make beautiful landing pages. 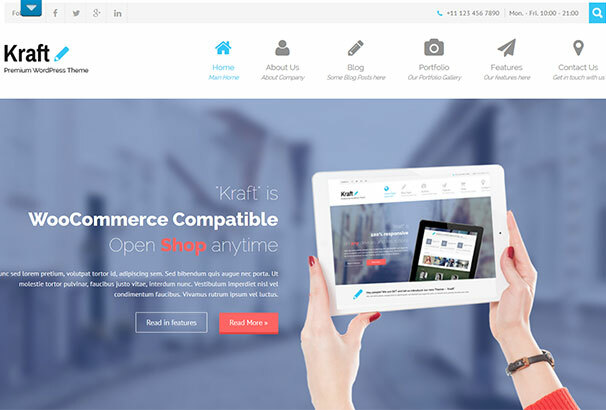 Fully responsive and SEO optimized, this theme has much to offer. 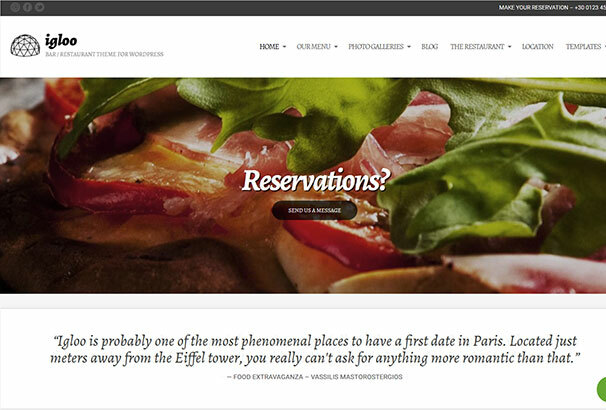 Showcase your restaurant and facilitate online reservations with this fully responsive superior WordPress theme. Featuring cutting edge, modern design and beautiful typography this restaurant WordPress theme is designed to turn heads. 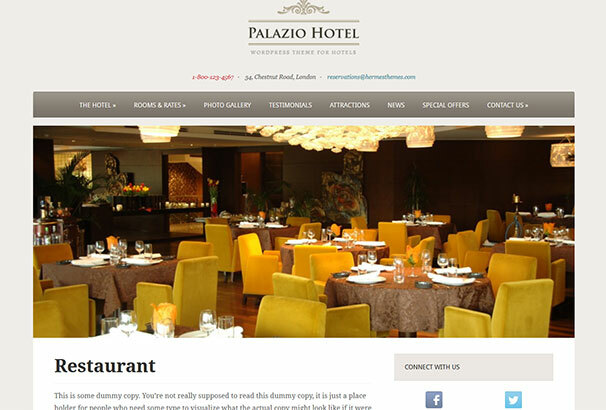 Palazio is a WordPress theme designed for hotels, hostels, resorts, spas and other small businesses. Classic design elements combine with the most state of the art features to allow you to create a truly compelling website. This premium theme by WordPress combines modern and simple design with a full list of customizable features to enable your very own truly unique website with a few clicks of your mouse. 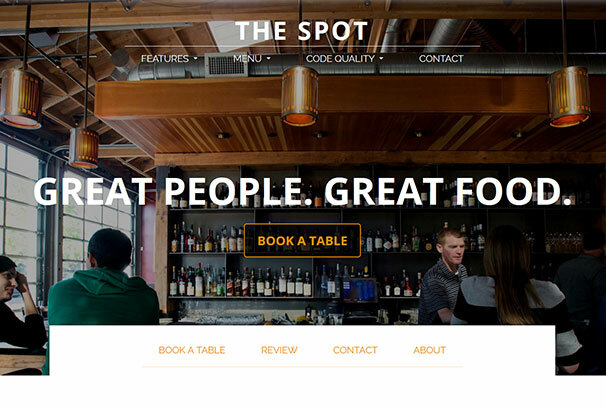 A vibrant WordPress theme for bars, gastropubs, destination restaurants and any venue with a cutting edge vibe, The Spot is fully responsive and displays equally well across all devices, allowing everyone everywhere to access your business information quickly and easily. This SEO optimized and fully responsive theme by WordPress is minimal and streamlined in design. Amazing features on offer include an integrated slider mechanism and fully customizable color palette. 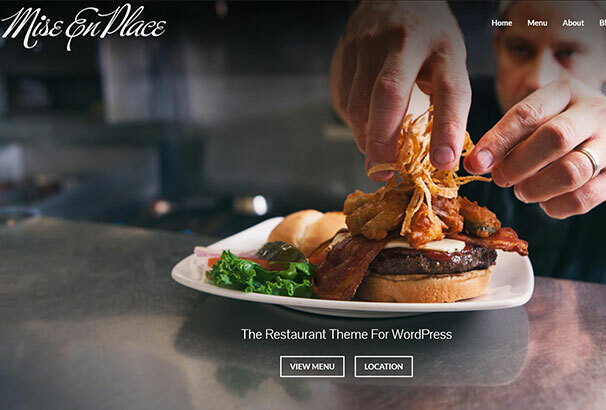 A bold theme designed specifically for modern restaurants, this premium WordPress theme is designed to turn your web traffic into foot traffic. 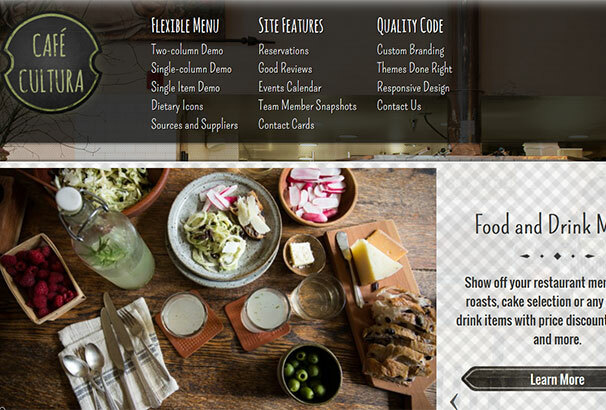 Showcase your contemporary cuisine with a little help from this quality fully featured theme. 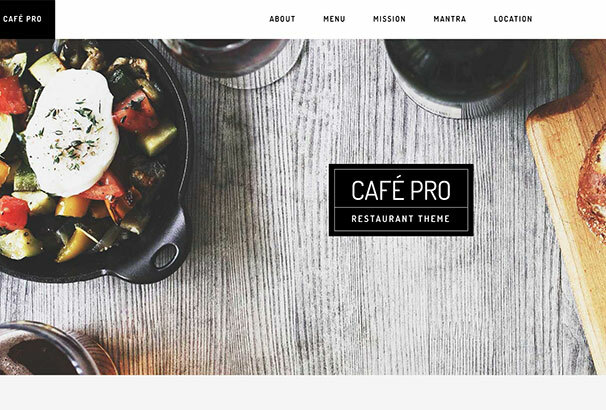 Café Pro combines elements of our two most popular child themes — Parallax and Foodie — to create the quintessential design solution for not just restaurants, but for any brick and mortar business looking to create a captivating presence online. This fantastically user friendly WordPress theme offers featured including a responsive slider, testimonials section and unlimited skin options using the bespoke color picker. 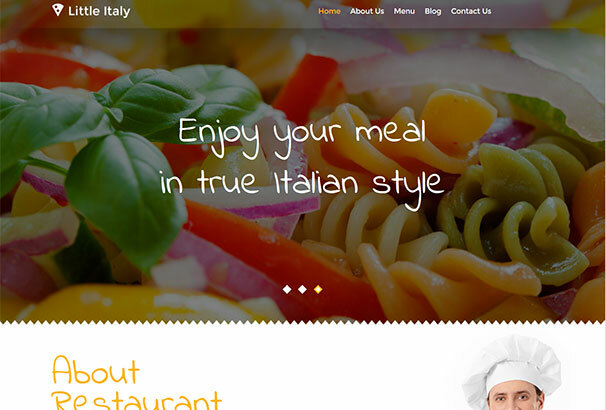 Little Italy is a premium WordPress theme suitable for use by Italian restaurants and many others. SEO optimized and fully responsive, this theme will give you all the building blocks to create a stunningly effective website with ease. 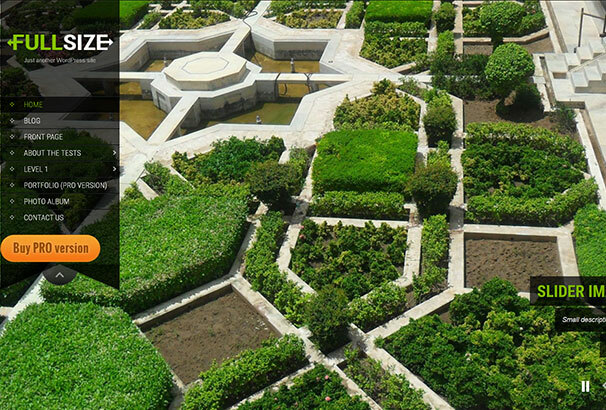 This theme is especially suited to off-beat cafés, boutique coffee shops, specialty restaurants and artisan producers. It’s distinctly wholesome flavor will appeal to any food business where individuality is key. 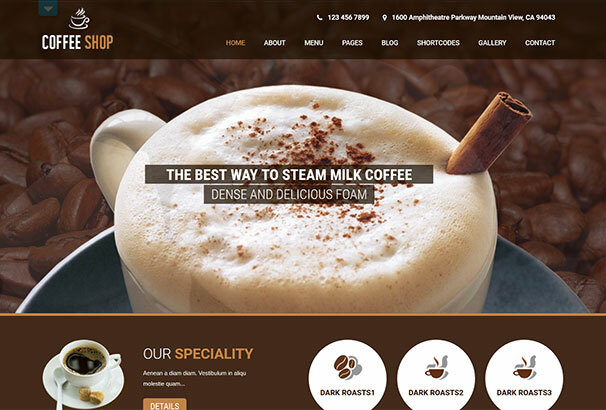 Coffee Shop is a responsive coffee WordPress theme which will appeal to boutique coffee shop owners and others. 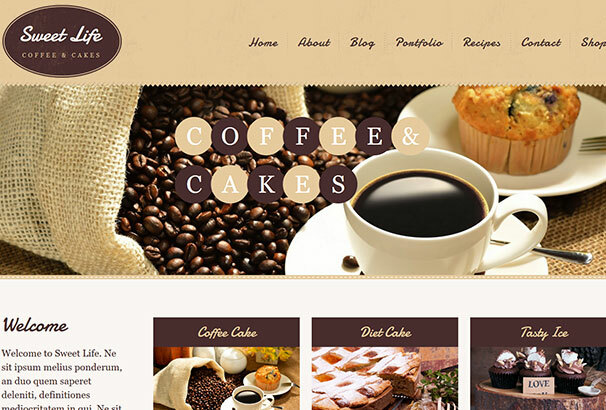 Let your latte do the talking with the help of this quality theme. Elegant and sophisticated, this theme is built with premium eateries in mind. Utilize its many features and create a compelling website that will tempt the taste-buds of visitors old and new. 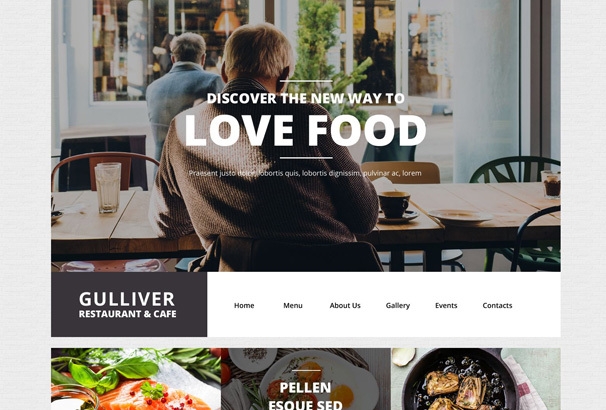 The Gulliver theme is a great choice for modern cafe and restaurant owners. The focus will remain firmly on the food with its extensive image gallery and its extensive range of features will enable you to create a truly bespoke website with ease. 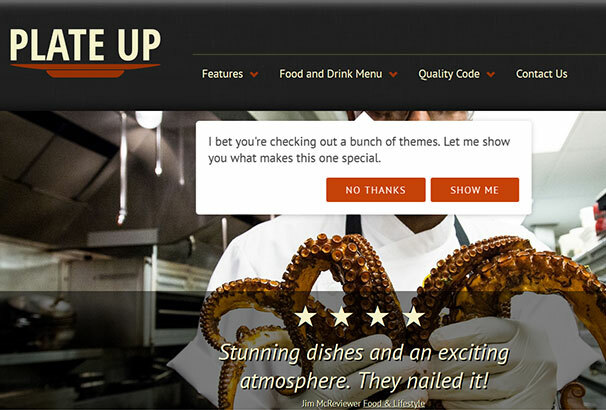 Umami is a handcrafted WordPress theme that’s perfect for restaurants and businesses alike. With built-in support for WooCommerce enabling you to easily sell products online, this theme will work on many levels to benefit your business. 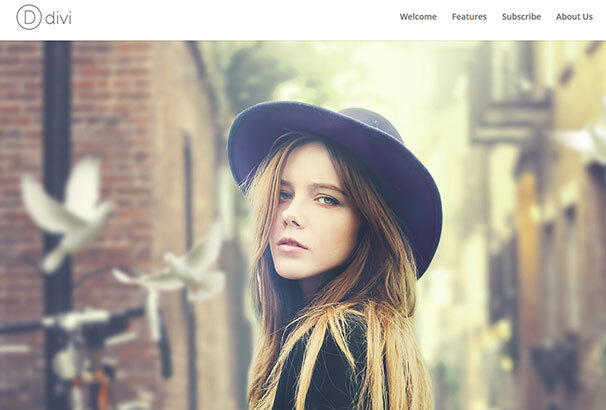 Understated elegance with a modern feel is the vibe of this premium WordPress theme. SEO optimized and fully responsive, it will ensure your new site displays equally well across all devices. 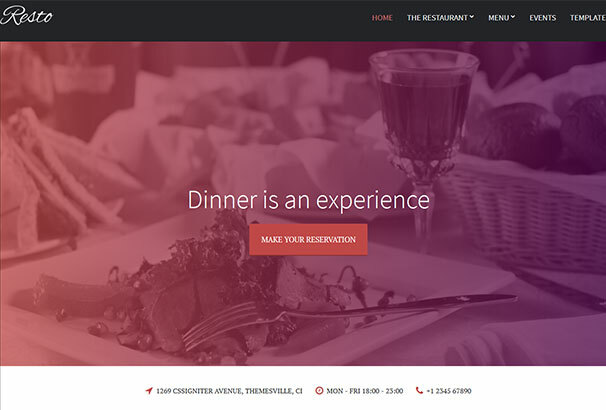 Bottega is a flexible and easy to use theme for restaurants and other eateries. Offering super simple menu management so you don’t have to upload PDF’s of your menus, it is incredibly easy to customize with your own logo, colors and style. This premium WordPress theme uses the most flexible layout engine currently available. With no templates and no need for advanced short codes, editing layout and design is easier than ever with its drag & drop technology. 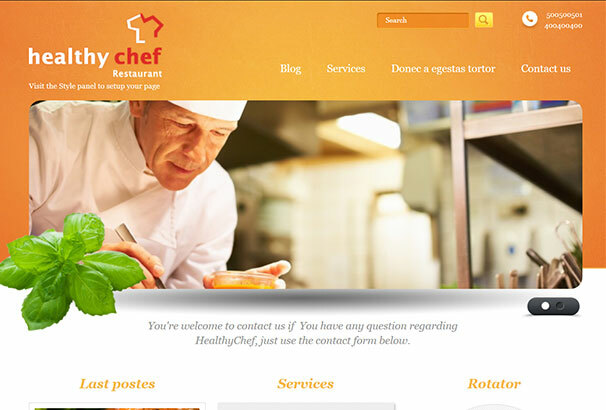 Healthy Chef is ideal fuse by many different eateries. SEO optimized and fully responsive, its highly customizable features list is second to none. 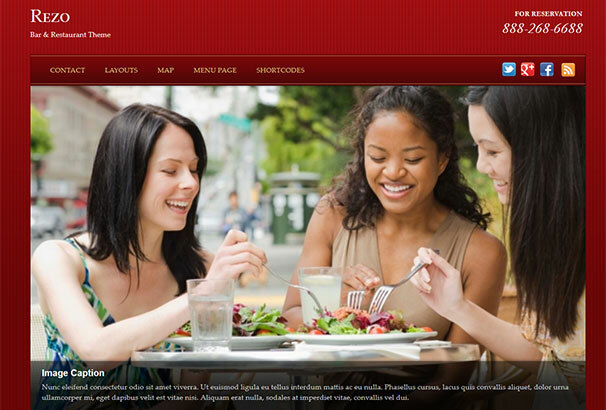 Slickly designed, this quality WordPress restaurant theme has widespread appeal. Change colors with the custom color-picker, simply switch the layout and add your own sliding menu-card to impress your customers. 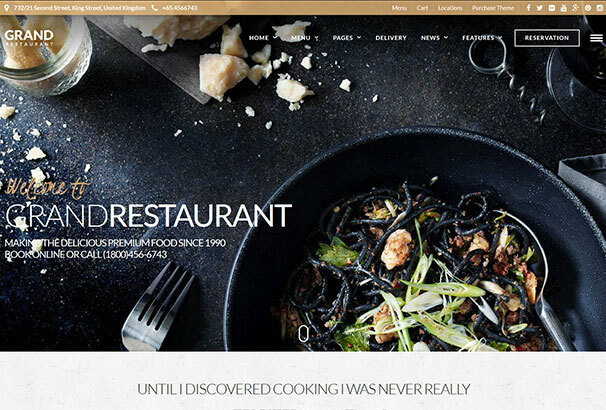 Highly customizable and eliminating the need for coding knowledge, this contemporary theme by WordPress has a full range of features to impress the most discerning restauranteur. 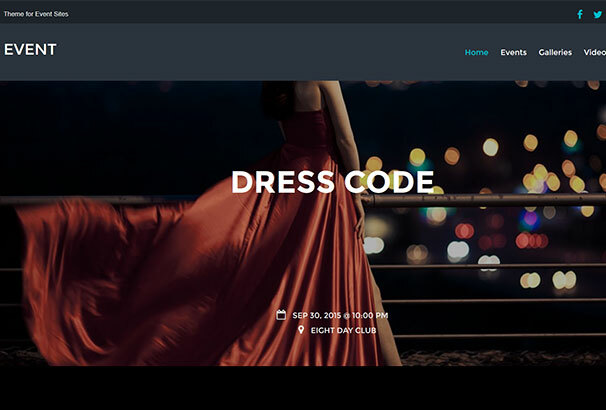 A stunningly effective theme with 3 pre defined color scheme, the Grand Restaurant theme comes complete with live customizer and responsive layout. 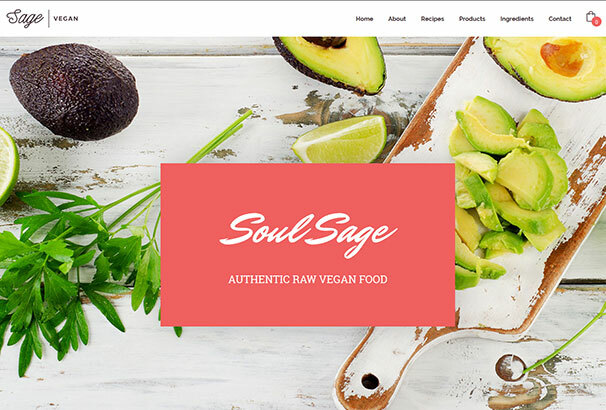 Sage is a flexible WordPress theme, built for restaurants, bars, cafes, bistros and other eateries. The theme includes the most popular premium plugins on the market including Visual Composer, Revolution Slider and Essential Grid. 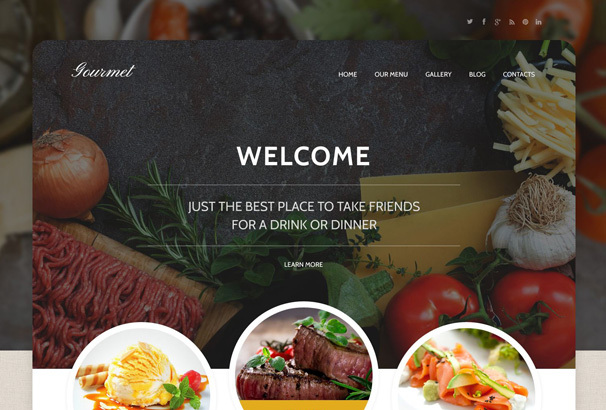 I would like to suggest you one more premium restaurant WordPress theme which is FoodFork. It is suitable for all kind of restaurant, cafe, coffee shop, fast food or pizza store. I’m sure that it will fulfill all your needs and build your website quickly and professionally. I coulpd nott refrain from commenting. Welll written! 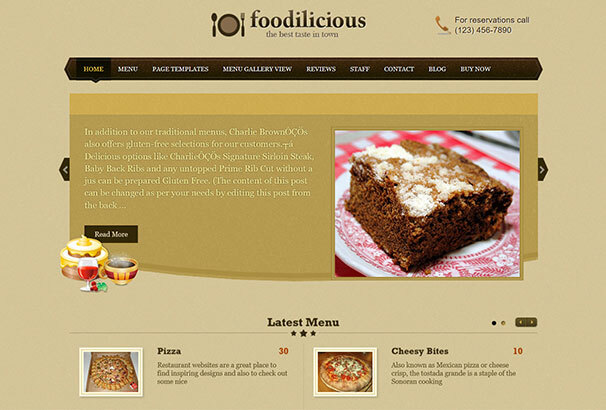 These are really good google responsive themes for food WordPress site. I would suggest everyone use these premium themes who wants to start a new restaurant blog.